During the last 30 years we’ve seen an onslaught of sport utility models flood the world’s automotive markets. 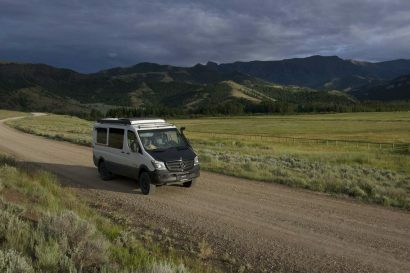 In an era where age 50 is the new 30, family station wagons have been exchanged for vehicles that can ferry snowboards and skis to the slopes, kayaks to the river, and camping gear to the backcountry. The Willys wagon led the charge back in the ’50s, and Jeep has been on the forefront of the SUV’s evolution with the introduction of a plethora of models. 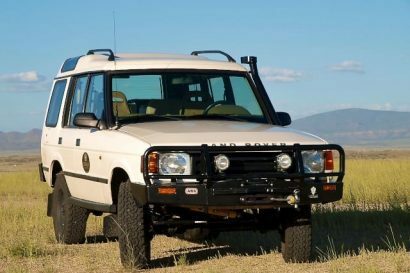 With a continued push to expand its presence as a global brand, the company went back to the drawing board to develop a compact platform that not only possessed seven-slot grille capability, but also the fuel economy, comfort, and price point required to compete in the international arena. 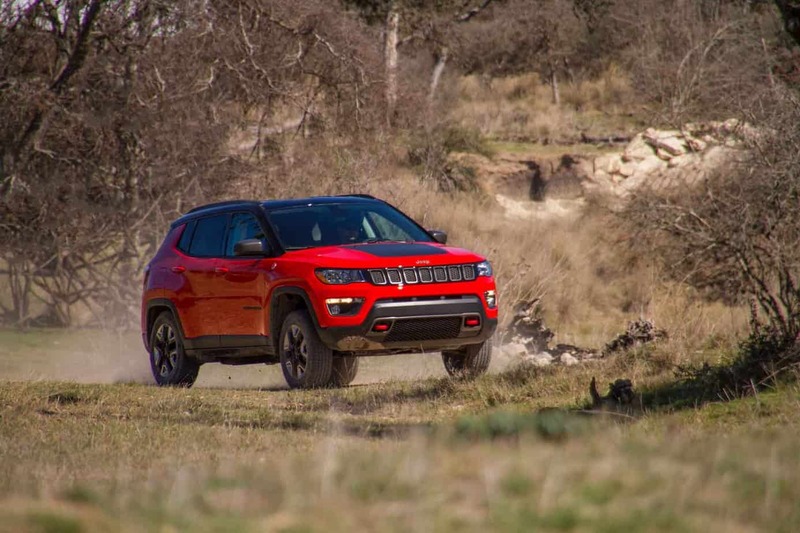 Enter the all-new 2017 Jeep Compass. 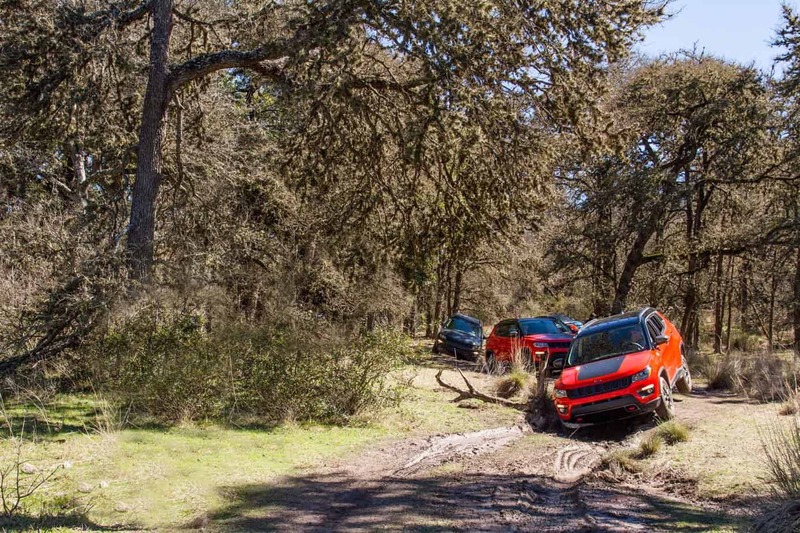 I recently spent a day in a Compass Trailhawk roaming the oak-studded hills near San Antonio, Texas. On winding country roads the Compass was stable and predictable. Pushing through tight corners and over undulated surfaces, as well as simulating emergency lane changes, produced limited body roll and vibration—evidence of its MacPherson/Chapman strut coil spring suspension and well-tuned Koni frequency selective damping system (FSD). The column-mounted electric power steering (EPS), which reduces parasitic drag on the motor and enhances fuel economy, was direct and centered—a fairly transparent change from conventional hydraulic steering. Under normal road conditions it is front-wheel drive (the rear axle engaging when needed) but there was little evidence of the typical torque steer associated with this configuration; a credit to the driving steering torque system (DST). Considering that the Compass falls into the compact-SUV segment, the interior feels quite spacious and there is plenty of room for my 6-foot frame. 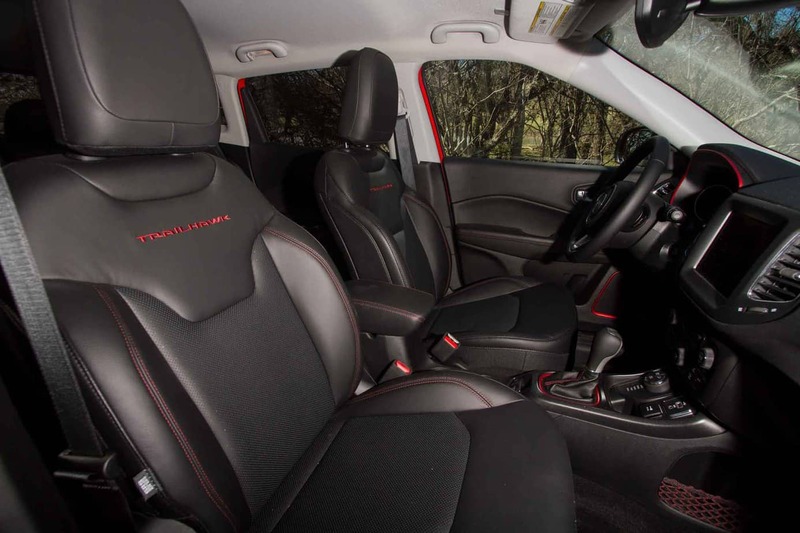 The heated McKinley leather seats hug the body, have a sporty feel, and are quite comfortable. 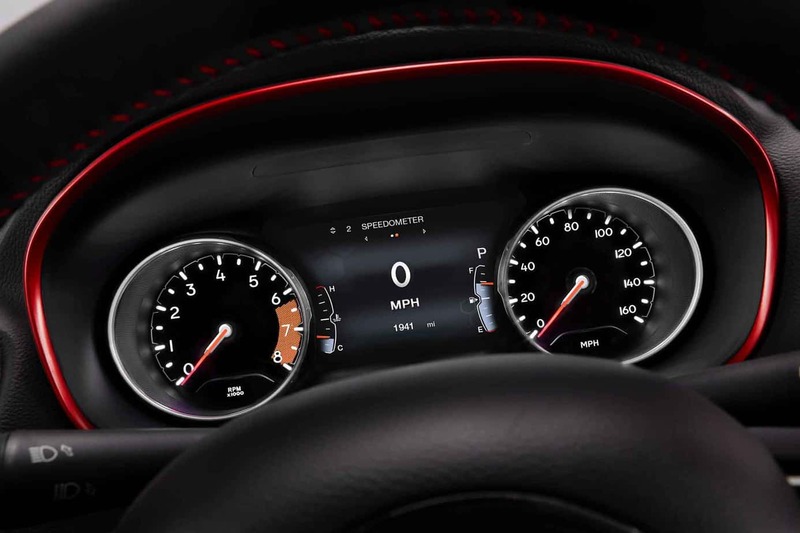 Instruments are in clear view and within easy reach from behind the wheel. The thick leather-wrapped steering wheel has a good feel and accommodates controls for Bluetooth comms, cruise control, and the premium audio system. USB and 12-volt power ports are conveniently located on the console, as is the 4WD selection dial. I liked the large, 8.4-inch Uconnect media center, which features voice recognition along with SiriusXM radio and real-time traffic and weather information. As is the case with most vehicles designed under the constraints of a wind tunnel, the front clip falls off into an abyss beyond the windshield, well below the driver’s field of vision. Visibility is good but it is hard to determine bumper/corner clearance in tight, technical terrain. There is much to be said about safer vehicles, but it seems that modern technology has all but taken the responsibly of operation from the driver’s hands. In addition to the regular suspects (anti-lock brakes, stability control, and advanced brake assist), the Compass features a host of computerized features to keep occupants out of harm’s way. A few of these include forward collision warning (if you aren’t watching the road), LaneSense Departure warning (lets you know if you drift out of your lane), adaptive cruise control (helps you maintain proper following distance), and blind spot monitoring for those who have forgotten the golden rule of mirror, signal, blind spot. If you still manage to crash the car, a cocoon of airbags (front, side-curtain, pelvic) will probably keep you around for tomorrow’s breakfast. Lastly, if you forget to pull your head out of the window, lift gate, or the dual-pane sunroof before pushing the close button, an auto-reverse feature will keep you from joining the ranks of Marie Antoinette and King Charles I. 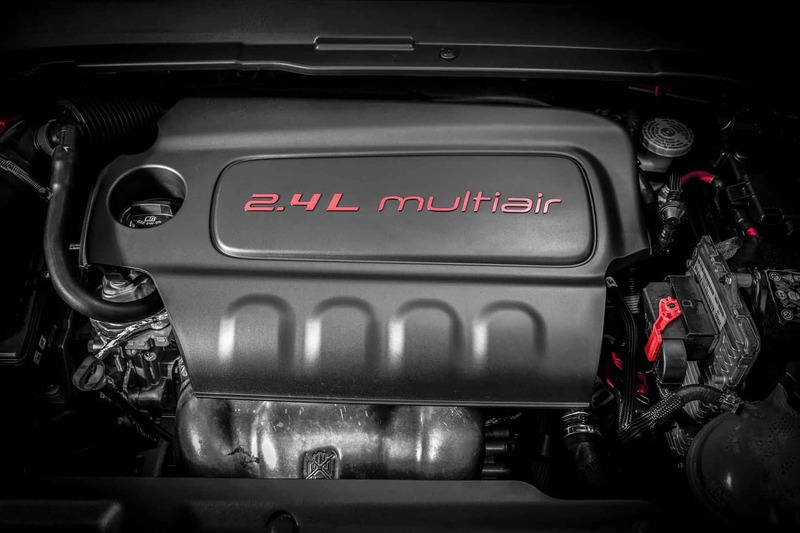 Although the Compass will be available with three petrol and two diesel engines for the world market, U.S. versions will only be offered with the 2.4-liter Tigershark MultiAir 4-cylinder. It produces 180 horsepower (@6,400 rpm) and 175 lb-ft of torque (@3,900 rpm), which is sufficient for the vehicle’s mass, but you won’t set any records at the drag strip. Transmission options are the C635 6-speed manual, AT6 Aisin 6-speed automatic, and the 9HP48 9-speed automatic. 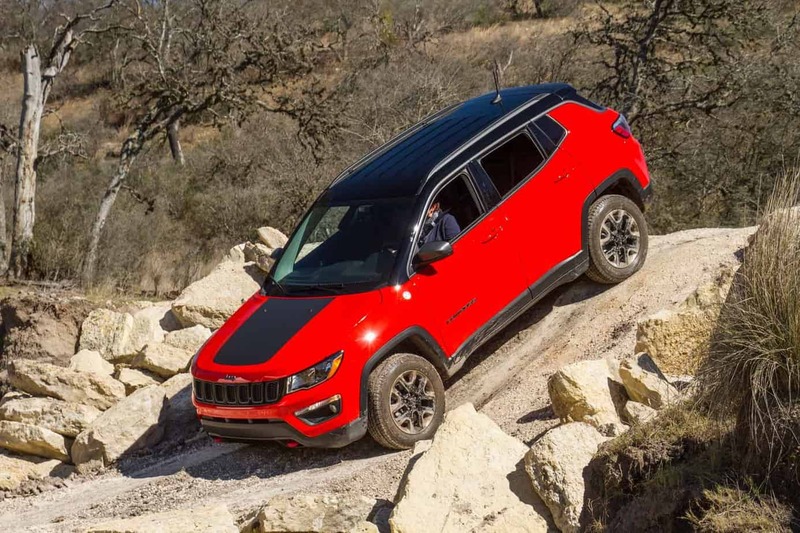 What this compact SUV lacks in Hemi muscle it makes up for with greatly improved fuel economy, which lands at 23 mpg city and 30 mpg highway. If we do the math—the fuel cell is 13.5 gallons—a comfortable range during a long haul will be about 400 miles. Jeep is boasting a 2,000-pound towing capacity, and while I did not have a chance to pull a trailer (this tow weight is not recommended for the 4WD), my guess is that it would be fairly taxing on the drivetrain. However, I don’t think pulling a Teardrop or small camp trailer would be an issue. 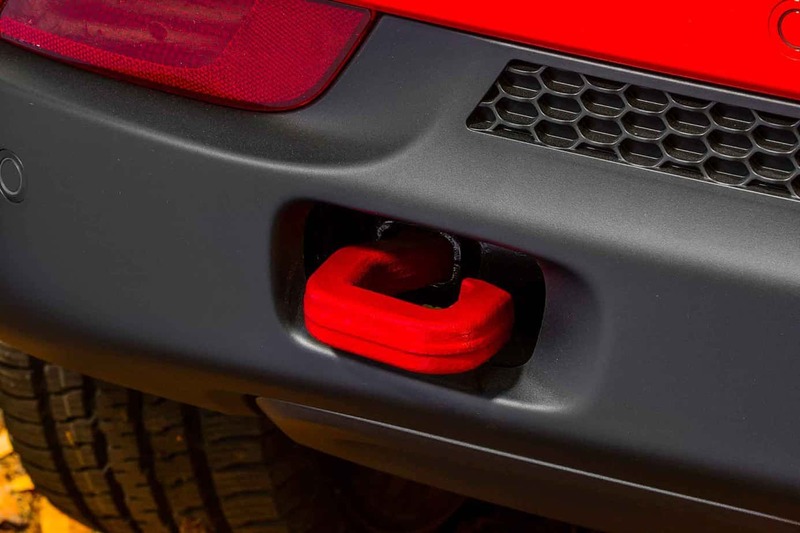 In four-wheel drive models, the rear-axle disconnect automatically disengages the rear drive system, reactivating when it senses the need for all-wheel traction. The net effect is that the 4WD versions can achieve nearly the same fuel economy as the 2WD models. As with many cars these days, engine start-stop (ESS) is standard with an automatic transmission. Personally, I’m not a fan of having the engine shut down at stoplights. We are told that it reduces fuel consumption, but I’ve also heard it has more to do with EPA requirements and credits. 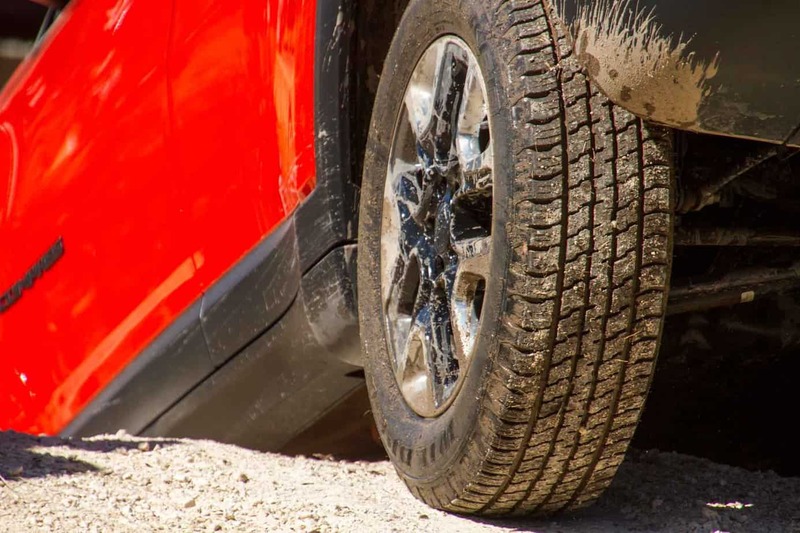 Although the vehicle’s IFS/IRS configuration provides up to 8.2 inches of wheel travel (rear), lifting a tire was common in uneven terrain. This is where modern electronic wizardry comes into play. Traction on the trail (and road) is achieved by the incorporation of several systems. 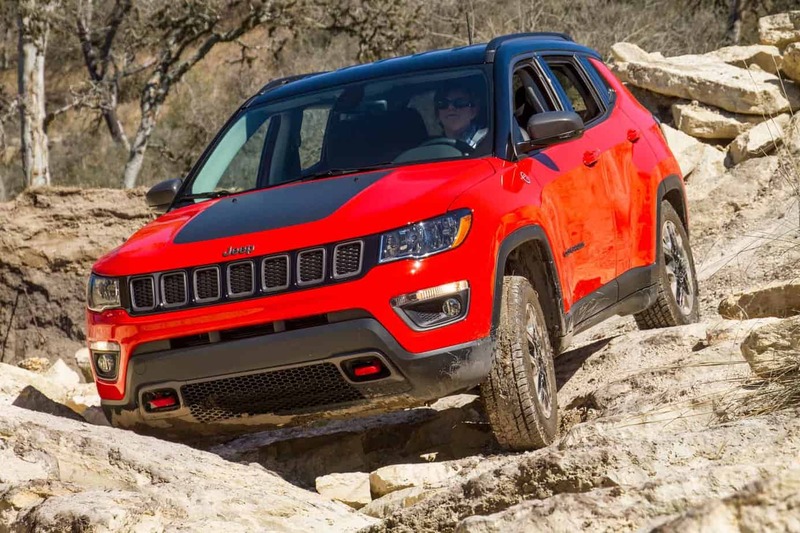 Jeep’s Active Drive power-transfer unit distributes torque fore and aft as needed without input from the driver, and a wet clutch located in the rear drive module manages torque bias depending on dynamic conditions. 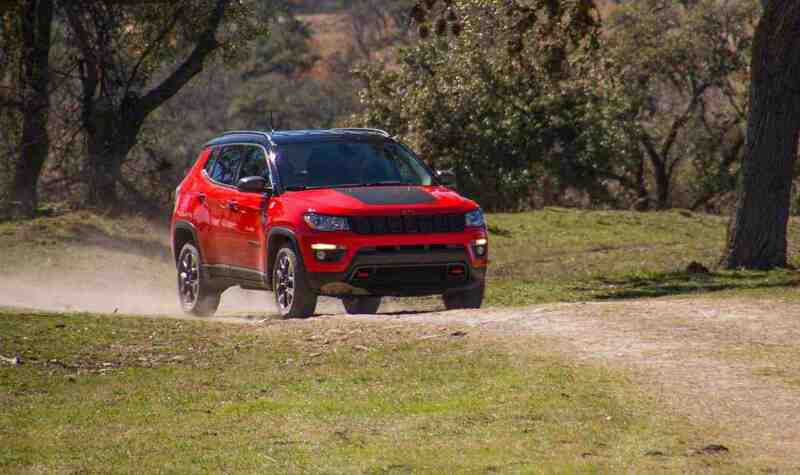 Additionally, Active Drive Low, exclusive to the Trailhawk, reduces the final drive ratio to 20:1. This does not substitute for the lack of a 2-speed transfer case, but combined with traction control (TC) and hill descent control (HDC) it does a pretty good job. The Selec-Terrain dial on the console allows for the selection of five separate trail modes (auto, snow, mud, sand, and rocks), and further refines the sensitivity of the system depending on terrain. 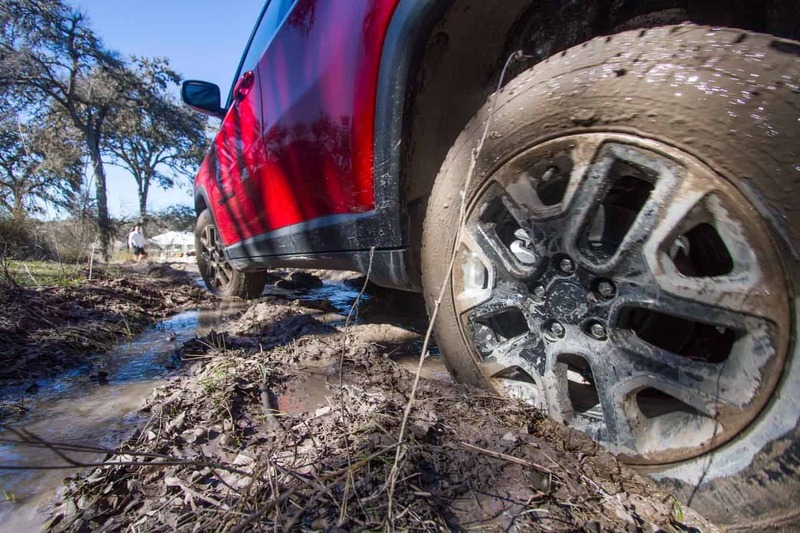 Wheel slip is greatly reduced in rock mode, and loosened up a bit in sand, snow, and mud. While traversing rocky sluices, steep inclines, and cross-axle situations I rarely had a tire slip more than a quarter turn before the TC engaged. It is quite impressive. 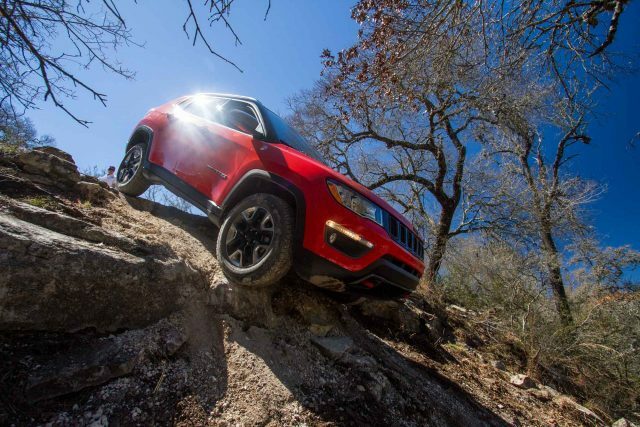 The Trailhawk sets a tad higher than the base model (1 inch) and its 8.5 inches of clearance under the belly is reasonable considering the 103.8-inch wheelbase. Vital components are protected by a series of skid plates, and approach, breakover, and departure angles rest at 30, 24, and 34 degrees respectfully. With the industry trend toward large-diameter wheels and low-profile tires—which all but eliminates the ability to air down for an enlarged footprint and improved traction—one of the first things I inspect is the size of the brake calipers. I was pleased to find the Compass’ calipers would allow for a 16-inch wheel/tire. Standard wheel sizes range from 16 to 19 inches depending on the model; the Trailhawk is fitted with the 215/65R17 Falken Wildpeak H/T. Lastly, I must give kudos for the inclusion of a full-size spare tire and legitimate recovery points fore and aft (rated at 2.5 times GVW). 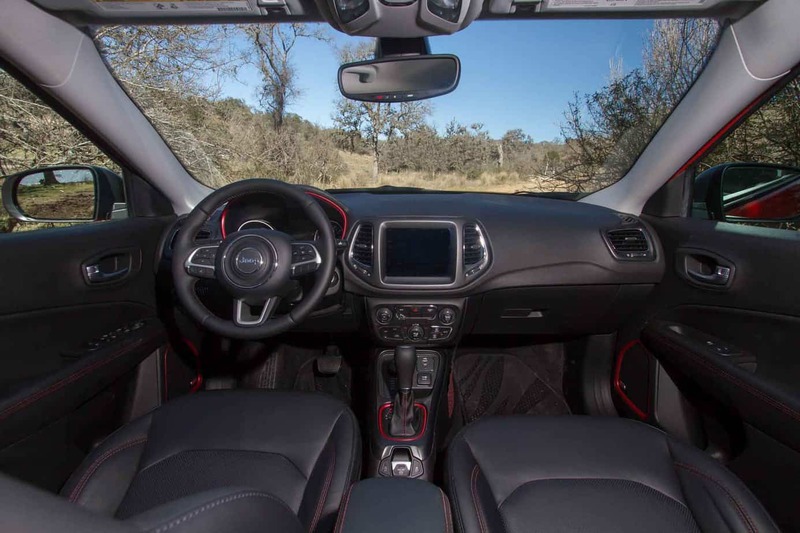 The chassis mirrors the Renegade’s modular unibody construction; the upper body structure and frame are engineered as a single unit. The use of high-strength steel (65 percent) and structural adhesives can be credited for the platform’s rigidity-to-weight efficiency. This extends to chassis-body interfaces, suspension brackets, and cradle attachments, ensuring stiffness and minimizing low-frequency noise levels in the cabin. 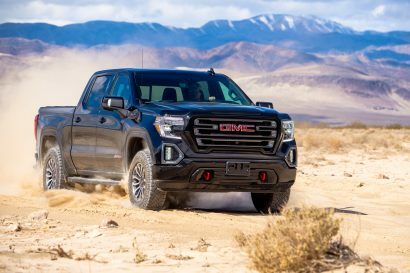 Although unibody construction became commonplace decades ago (in the 4WD SUV sector), and design has been improved upon greatly in the last 10 years, there are still some shortfalls. The primary, in my opinion, is the limited ability to mount an aftermarket bumper. This is largely due to increasingly strict, government-mandated crush zones, which now occupy considerable real estate behind the headlights. Considering the fact that the recovery points reach far back into the depths of the engine bay, fitting a proper winch-mount bumper on the Compass will be quite the puzzle. 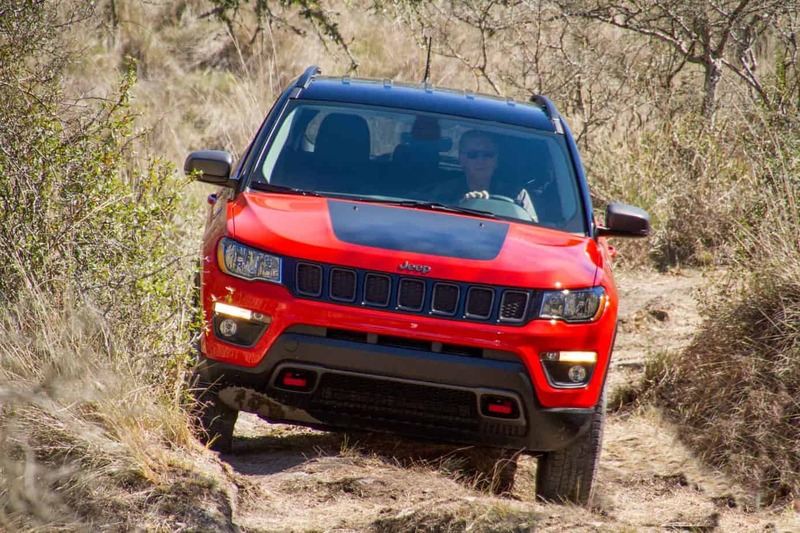 As Jeep expands its global presence, the Compass platform will be offered in more than 100 countries around the world. Although it has been designed and engineered in the United States, I’m disappointed that it won’t be built here—current production is in China, India, Brazil, and Mexico. 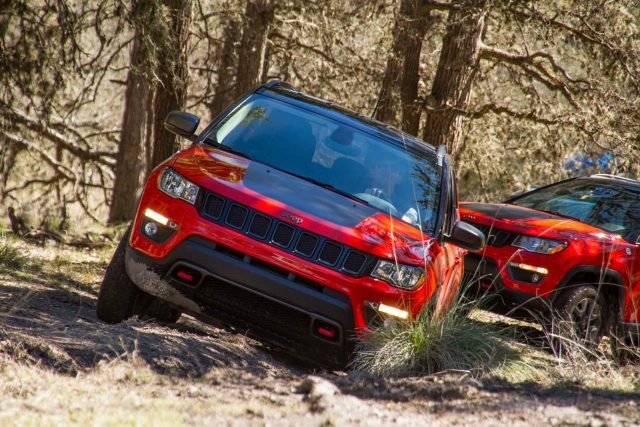 I spent the day in the Trailhawk, but the Compass will also be available in Sport, Latitude, and decked-out Limited models. As always, I’d like to see a diesel offered in the U.S., but the 2.4-liter Tigershark mated to the 9-speed automatic provides a desirable balance between performance and fuel economy.